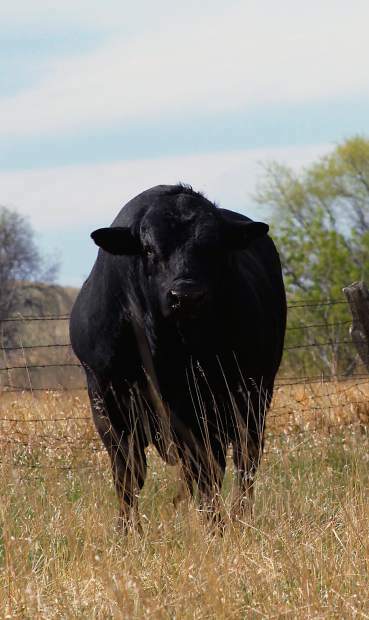 Ranchers should use only virgin bulls on their cow herd, or should make sure the bull has tested negative for trichomoniasis before turning out this spring. File photo. "Perhaps the one reproductive disease for which the bull plays a critical role in transmission is that of trichomoniasis, or "trich," Daly said. Daly explained that although this disease has been around for generations, for many years it was thought to be something only states west of the Rocky Mountains had to concern themselves with. That changed for South Dakota cattle producers back in 2004, when more than 40 herds were detected with the disease and were faced with the task of cleaning it up. A cooperative effort between the South Dakota Animal Industry Board and cattle producer organizations resulted in the implementation of regulations that not only tackled importation of the disease, but Daly explained the effort also reduced the spread of the disease within the state. These regulations involved testing of all non-virgin bulls moving into the state or between herds, as well as the prohibition of open cows being sold back into breeding herds. "Since 2005, South Dakota enjoyed years of very few new infections, however beginning in late 2015, several newly infected herds have been identified. Counties recently affected include Corson, Dewey, Gregory, Mellette and Oglala Lakota," Daly said. "Whether this represents an incursion from other parts of the country or a resurgence of a previously undetected problem is uncertain." Trich is caused by a protozoal organism that lives indefinitely in the sheath of an infected bull. Once it's transmitted to a female through the act of breeding, it causes an inflammation in the reproductive tract that results in the loss of the pregnancy. While infected cows can clear themselves of the infection, bulls remain positive for life. Therefore, Daly said detection strategies for this disease come down to testing the bull. "We have come a long way over the last 10 years in the methods used for detecting the organism," he said. For testing bulls, the preferred sample is still a scraping from inside the animal's sheath. "This is where the protozoa live, protected by the microscopic peaks and valleys in the skin inside the sheath," he said. Daly said the most commonly used lab method for trichomoniasis detection is polymerase chain reaction (PCR) testing. "This is a very sensitive diagnostic technique that can detect just a few organisms, as well as those that are no longer living," he said. He explained that the culture method previously used was fraught with enough short-comings that veterinarians were required to take three samples at weekly intervals from the bull in order to ensure that an infection was not missed. In contrast, only one sample is required from a bull if PCR is used. Overall, Daly said that improvements in test sensitivity and in awareness of trichomoniasis have significantly reduced the risk of its introduction into our cattle herds overall. However, he reminds cattle producers that, as these recent new cases have demonstrated, trich is a long way from being eradicated – and will remain a consideration for cattlemen for a long time to come.